Richard John Boyens, 79, of Decatur, beloved husband, father and grandfather, passed away Saturday, February 10, 2018. Born in Brooklyn, NY, November 3, 1938, he was the son of the late Clarence and Esther Jacobsen Boyens. Richard learned to fly before the age of 16 at Marine Park Seaplane Base in Brooklyn and was flying before he could drive. 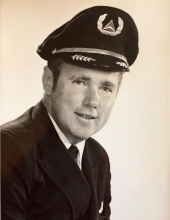 He became an air traffic controller at Laguardia Airport when he was 20 and went on to be a commercial pilot for Pepsi Cola before finally joining Northeast Airlines which later merged with Delta. He retired as a captain from Delta after over 20 years. In addition to flying, Richard enjoyed golfing, tennis, bird watching, and spending time with his family. Richard is survived by his wife of 58 years, Marguerite Coffrin Boyens; his daughter Bonnie Boyens Craft and her husband Ronald; his son Timothy Richard Boyens; and his daughter Jennifer Boyens Victor and her husband, William; grandchildren, Ethan Craft and Eliza Craft, and Julia Victor; and many more loving family and friends. In addition to his parents, Richard was preceded in death by his brothers, Edward and Robert Boyens. In lieu of flowers, donations may be made to Crossroads Hospice, https://crhcf.org/Donate/. "High Flight (An Airman's Ecstasy)"
To send flowers or a remembrance gift to the family of Richard John Boyens, please visit our Tribute Store. "Email Address" would like to share the life celebration of Richard John Boyens. Click on the "link" to go to share a favorite memory or leave a condolence message for the family.